They say the mouth is the window to the body. 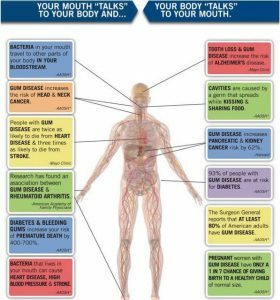 All sorts of health concerns exhibit symptoms in the mouth: diabetes and celiac disease to name two. If certain diseases can be detected in our mouth, is it also possible to prevent certain illnesses by taking better care of our teeth? Researchers think so, and they’re hard at work trying to find out which diseases good dental hygiene might help prevent. Endocarditis is the infection of the valves and lining of the heart muscle. Unfortunately, endocarditis can be fatal if treatment is not successful. Patients with heart conditions will always want to keep their doctor informed of their condition so as to properly prepare before and after any appointment. Because bacteria in the mouth can be released into the bloodstream during an appointment and infect the heart in at-risk patients, it’s best to maintain an open line of communication with your doctor and keep as clean a mouth as you can. Generally speaking, dental work can be safely performed through the first half of the third trimester. The American Dental Association has pointed to research linking premature birth and low birth weight to women with gum disease. Therefore, it is important to schedule your dental hygiene appointment with exam early in your pregnancy. You may not think to link a healthy mouth with a healthy colon. However, researchers at Case Western Reserve University have linked the oral bacteria Fusobacterium nucleatum and colon cancer. Their research suggests this bacterium has the ability to “turn on tumor growth in the colon,” a discovery that may lead to early detection for at-risk patients. Research suggests treating acute cases of periodontitis (gum disease) can reduce the discomfort associated with rheumatoid arthritis. What a great reason to schedule a visit to the dentist! Research has found that people with poor oral hygiene or gum disease could be at higher risk for developing Alzheimer’s compared with those who have healthy teeth. Additionally, gum disease may increase the risk of heart disease and fatal heart attacks. Please click here to schedule an appointment at Adams and Cheek Dentistry or call us at 919.866.1360!